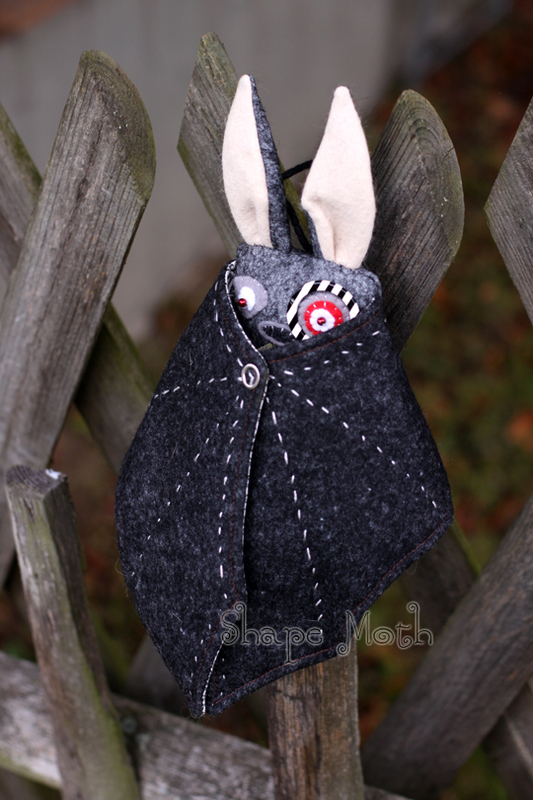 Shape Moth: Ghastlies Blog Hop! 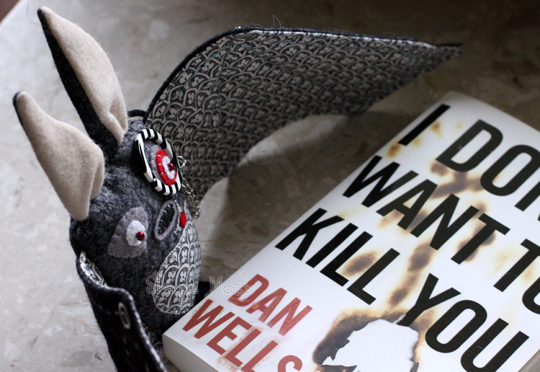 Meet Evil Emil the Bat. Ghastlies Blog Hop! Meet Evil Emil the Bat. Welcome to Day 1 of a Ghastlies Blog Hop which is organised by Madamme Samm! You can find the schedule for the rest of days here. Don't forget to leave comments under each post, including mine. You will be entered in the giveaways! And the prizes are wonderful! You can read about them at Madame Samm's blog! Dzis dzien pierwszy cyklu postow pokazujacych projekty uszyte z materialow z kolekcji The Ghastlies. Ja i 53 inne zdolne uczestniczki przez 10 dni bedziemy was zasypywac ciekawymi pomyslami. Oprocz mnie, dzisiaj, 4 inne uczestniczki pokaza wam swoje projekty (lista blogow na dzis jest u gory). Kazdy, kto zostawi komentarz pod moim postem i pod postami pozostalych uczestniczek wezmie udzial w losowaniu wspanialych nagrod, ktore mozna obejrzec na blogu Madamme Samm. Codziennie przez 10 dni na kilku blogach beda posty z The Ghastlies. I codziennie, komentujac pod postami, mozna bedzie wygrac nagrody. Lista wszystkich postow na nastepne dni znajduje sie tutaj. EDIT: I just listed Emil in my DaWanda shop, so you're welcome to give him a new home! 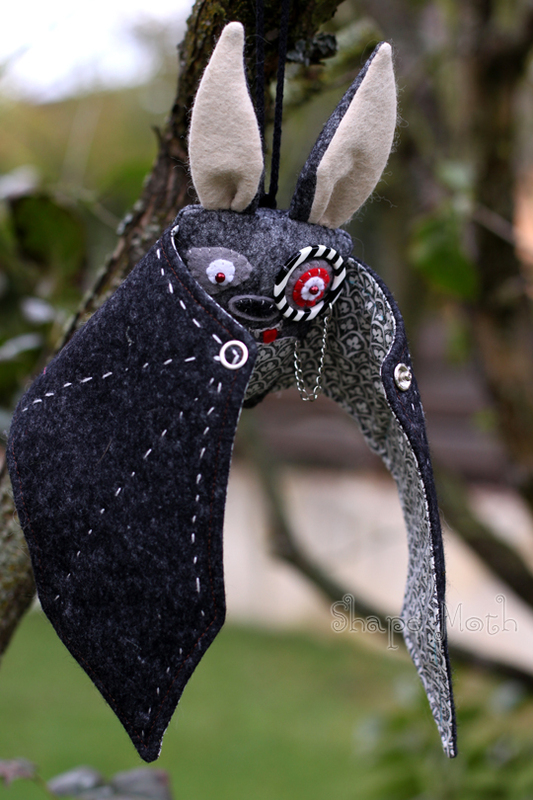 Hope you like Evil Emil the Bat :) Maybe he could be more Ghastly, but he's a bat. So he fits, I think... LOL. He is sooo cute and shocking at the same time :) Love it! I love him)))) I love all of your bat))) charming they!!! He's terrifying! I love him! Do you have a pattern for him? He is pretty scary looking! adorable and yet still creepy. nice work. I think he is more cute than scarry! What a super bat - love the way his wings fold over in front! YOu my dear Mrs Joanna Ghastlie are BATTIE.. Such a cute Emil. Thanks. I love your ghastlie bat! I started to say he is adorable but I thought that might offend Emil, so instead I will say he is a fright. Thanks for sharing. Love him! He's so cute! Oh, I mean, evil. Yes, he's so evil-looking (don't want to offend him!). Oh, he is darling! I second the request for a pattern! What an adorable bat and the detail! I love your bat and I love your blog! !I hope you will come out with a pattern for him!! He is almost too cute to call Ghastlie. Love him to pieces. Dein Fledermäuslein ist S U P E R !!!! ...die ist ja richtig süüüüßßßß. How clever of you - love the monacle and the snap on the wings so you can 'wrap him up'! Thank you for sharing on this unique' blog hop. I don't like bats, but yours is pretty cute! Emil is a wonderful decoration for Halloween. For a bat he is cute. Love all the details you gave him. Cute and creepy! Love it! very cute. love all the detail on him. I love Evil Emil!! Brilliant and quite scary!! So cute...I mean, scary!! Love him! He is adorable in a scary sort of way. LOL. I hope he and Mr Cat find a way to get along nicely. How could evil be so cute? Love your batty project! That bat is adorable and I LOVE that his wings can stay in a folded position with that little snap - what a brilliant idea! I never thought I would say this but, I adore your evil bat! How cute! I love him all wrapped up! Great job! Very, very cute. I don't think he's evil at all. He looked right at home in the tree. Oh, I think he is perfect! And that monocle was absolutely inspired! I like this bat better than the ones that fly through my garden at night! Very cute! He's so interesting! I love his expression. Love him! 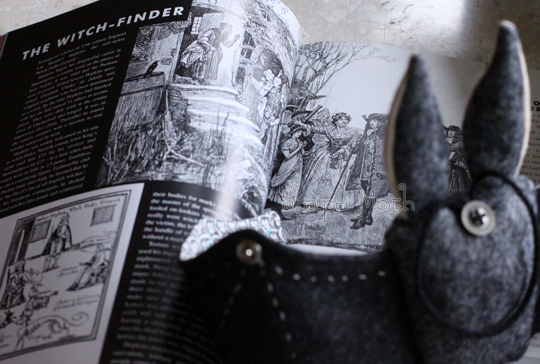 Especially his little monocle and the stitching on the backs of his wings, and that snap....all so awesome! Love your post of Evil Emil! He is sew cute. Great job. Too cute! I like that he went exploring. Emil is amazing. Love his monacle. Emil is cute, and I like that he went on an adventure outside! What a clever thing to do....love him! He is Awesome! cute blog post! I love your batty bat! Oh my goodness, he's wonderful. Did you use a pattern or make him up? He's perfect. Awwww. He's just misunderstood. I think he's cute! P.S. you can count me out of the drawing. What a cute bat, I love his eyepiece! What a great bat!! I love how you used the ghastlie fabric!! I must say - you are extremely creative!! Thanks for sharing!! Evil Emil is sort of scary but also adorable! What an absolutely darling (evil, mean, sinister)little owl. I especially like the snap closures for his wings! I love bats. Yours is so cute. We actually had some bats in the eaves our house. We counted 23 one night but we have to do something so they won't come back and end up in our attic. Oh how ghastlie is he....very cute well as far as bats go. But please tell him he is frightening so his feelings will not get hurt....have a great day. What a wonderful bat!!! You really captured the fun in a Ghastlie way. he is so cute! is there a pattern? I love bats, I love Emil and I love Ghastlie. Do you have a tute for Emil? You've had quite a fun time with that cute bat! Thanks for sharing him with us. How adorable! I never thought I would say that about a bat! Third time's a charm...I was determined to get my comment in, (thanks Blogger). I'm usually not a fan of bats...be he is adorable! Bats are always scary and Emil is no exception. Love it......um him. He is so cute with his little monocle. I love your story. I think he looks like a great friend. He's cute! Without a doubt, the CUTEST bat I've ever seen! amazingly creative! thank you for sharing! Well I love your bat! We have Pipstrelle bats living in our attics! Love your bat... that eye makes him... and your choice of fabrics is right on! He is cute as a batton! Emil rocks. I bet he was a blast to make. Great photos. Thanks for introducing him. He is quirky-cute, and his monocle is a debonaire touch. I'm going to have to browse your past posts to see what all the jazz is about your other bats! Thanks for showing us your creations. Evil Emil is pure evil in a fun way!! Thanks for the chance to win!! Emil....love the name. He is so cute and spooky at the same time! Emil is a little frightening, but he's wonderful! Wow such a cutie pie the bat is. My little girl would love him so much. She loves bats. Please stop by my blog. I am having a Halloween blog party hosted by Vanessa of A Fanciful Twist. Oh, he is darling! You did a wonderful job! Love the cat picture. Wow! That's an awesome bat! 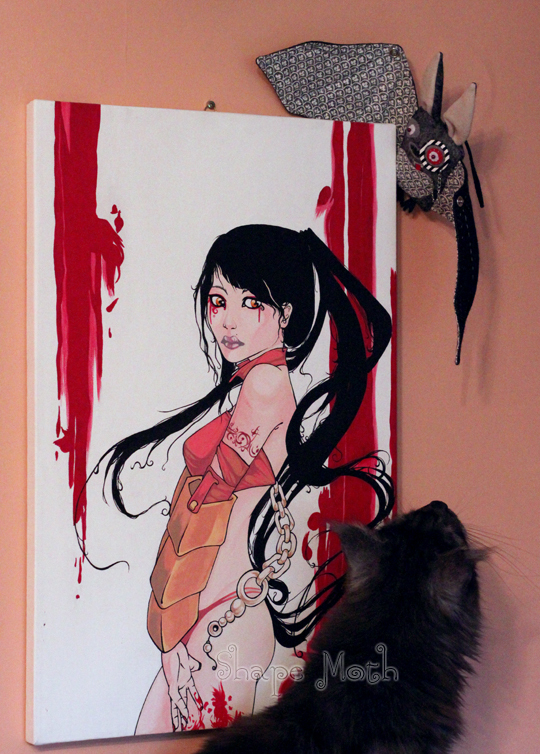 LOVE the pic of Mr. Cat checking him out! Cute and weird at the same time!! Great project, he's really cute! I just love the bat. so cute with his wings closed. Wow, what an amazing bat! You did a wonderful job, Emil is one neat critter! I will just bet that your Ghastlie bat has a 'softie' side to him! He is great! Good work! OMG!!! !Emil (luv the name) is just too cute and a wee bit creepy. Luv the picture with him wrapped in his wings. Wow. I just love him so much! Emil is adorable!! Love it when he is wrapped up in his wings... too cute! I love Evil Emil but I think he is msre cute than ghastly! Oh, he is adorably, ghastlie cute!!! Love the picture with your cat! Emil is adorable. Doesn't look evil to me at all - just looks like he's having a LOT of fun!! Oh, I love him! He is simply fabulous for sure! Oh, how frightfully delightful is her! I LOVE his monacle! Great little Ghastlie indeed! 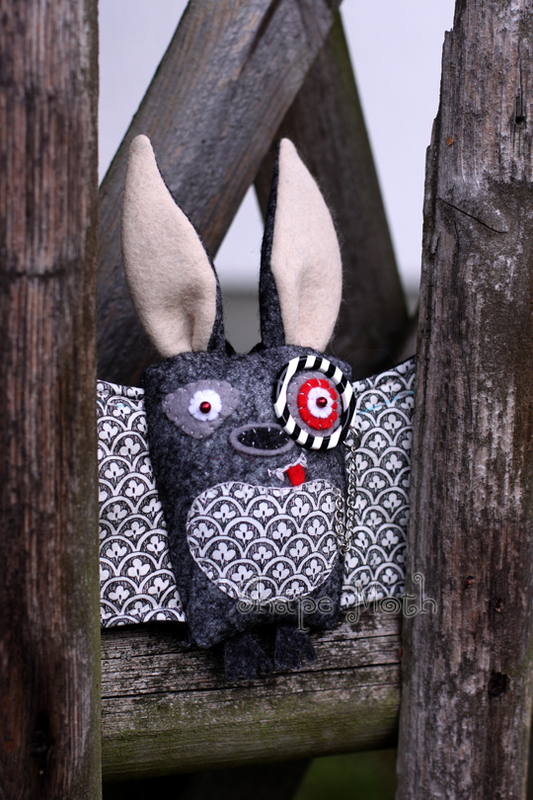 Emil is the cutest bat I have ever seen , well done! He is too cute! I love how he turned out. Great Job! Emil is a scarey cutie! Love how his wings fold around him and what a cute story! I love him and am 'a little' afraidddddddd....giggle. Such detail. He's a great bat. OMG he's adorable ... in a ghastlie way, of course! Cute bat! Love all the poses you have him in. Oh my gosh. How cute and the kitty is surely keeping an eye on that bat. Eeeek! What an evil looking bat. Come to think of it, aren't they all evil looking? Ghastlie! Now how cute is that! So very creative! My little buglets would love your bat. Love it! What a cute way to start the hop!! I've been inspired to make a few little bats now myself! I love that his wings close. What a wonderful little bat! What a great bat! Great job! Great job on a ghastlie little bat. He's really cute thought. HE'S FABULOUS! I love that his wings snap closed and his monocle. Will you have a pattern for this evil little guy? Emil is a great ghastlie bat. I fell in love with the ghastlies last year. I love Emil and all his pictures. Thank you for sharing him with us. I wouldn't usually think bats were cute but your bat is definitely cute and wonderful. Too cute to be a bat! Love him. I started following you yesterday when I came a day too early. So creepy...love the way his wings button up like a vampire cloak. He is such a fun piece, it makes me like bats, lol. 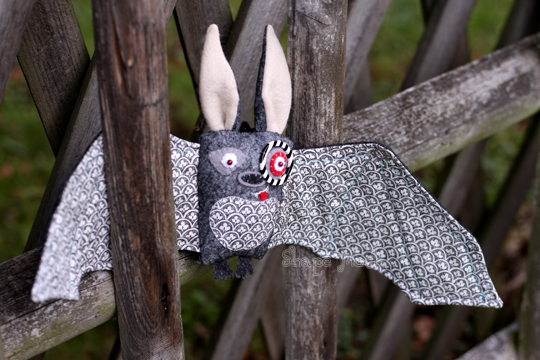 the ghastlies collections certainly is ideal for projects such as your cute bat ... just right for halloween decorations. So cute. Love the eyes. Awesome! My son had a thing for bats a couple years back. This would have been perfect. Thanks for sharing! He is so cute and I love the black and white button around his eye. Emil Evil is awesome! I love how he checked out your library and your garden. Just too cute! He is such a cute scary bat! So cute, evil though he is. I love the Ghastlies. He is so cute!!! Love it!!! I LOVE his eye with the button monocule and even the chain hanging down!!! He is the perfect Ghastlie! Love the Ghastlie fabric you used--it is perfect! That is an adorable bat! How could he be evil! He's too cute to be evil! Gastley bats are all the rage! Ok, Emil is way too adorable! I agree with some of the other posters, you should definitely create a pattern for him. I specially lovenhis little striped monocle, he is precious! Thank you so much for sharing him! So Cute! He is perfect for the season. Oh I love bats!!! You can never have enough bat toys in my opinion (and we have several). Great Job! Boy that bat was making himself at home. He is kinda cute. And I thought Bats only liked the dark, silly me. Thanks for the Goulish giveaway. He's wonderful! I love him! I would put velcro on his wings so he could wrap around my travel coffee mug and protect me from the heat! That is an awesome bat! Thanks for the inspiration and the chance! Dark and creepy...love it! thanks for the inspiration! What a great Ghastlie. Emil is perfect, love his folding wings. Very original. Luv the EYES! Very sneaky that little fella, turning up every where!! Emil is darling! Great job! He really looks like a pet for the Ghastlie family. Be sure to check out my blog on Wednesday! He is just scary enough but so adorable! Well, I'm not sure if I'd be scared if Evil Emil flew in my house or not. I think he might grow on me. lol. Thanks for sharing him. I love the evil bat! Happy Ghastlie Hop! How very clever this little bat is! Hard to make a bat lovable, but you did! What a sweet little guy! I love it - thanks! That is a great looking bat! Thanks for the giveaway, too. Oooooooooo! He's so evil he's cute! hee,hee,hee. Evil Emil is actually a sweet little dude though not very cuddly - just a Ghastlie pet. That is the Coolest craziest Bat EVER!!! Any patterns for this little fellow? new Follower and i think im going to love it ! 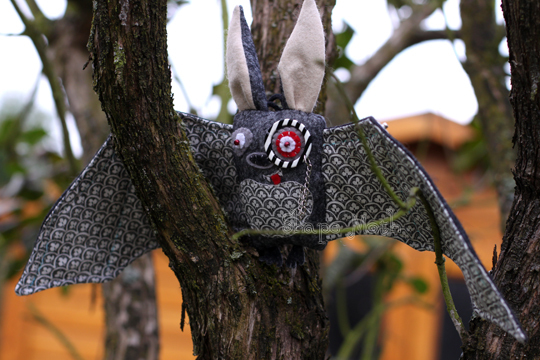 Fabulous bat - fabulous blog - I am now a follower. Thanks so much! Happy Halloween!